Wordless Wednesday ~ Now Where's My Watering Can? No it's not the comic duo I'm referring to when it comes to ' In A Vase On Monday' but the size of the respective vases. The first pickings of calendula 'Sunset Buff', grown from seed, all the flowers so far varying in shade and shape. I'm not sure whether that was meant to happen but still a gold star so far. Sown under cover on 17th March the first flower opened last week. Time still to get a second batch sown methinks. Some sprigs of an old favourite in the most easy going perennial that is alchemilla mollis. A few little white buttons of another old favourite, the lovely ranunculus aconitifolius, commonly known as 'Fair Maids Of France'. This is an easy going shade loving perennial. It's one of those which goes completely underground relatively early in the season until the following spring. Now to my second vase. I would dearly like be able to say here is one I made earlier but ...... this was on the 'Flowers From The Farm' stand at the RHS Chatsworth Flower Show last week and I think that it's simply too fabulous not to be shared. I thought that it might be of special interest to Alison who is currently setting up a flower farm business. I am not going to attempt to name the flowers except from the red rose which I found out is 'Hot Chocolate', a rose that I have read about but have never seen in the flesh before. It's gone on to the wish list and no ..... it doesn't smell of chocolate. If only! 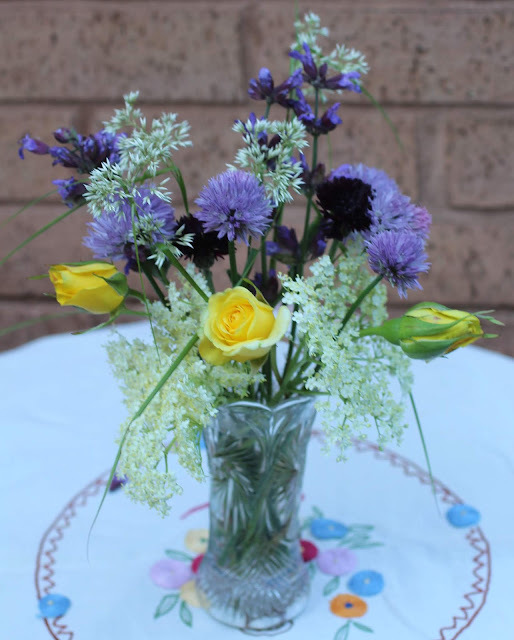 Every Monday Cathy over at 'Rambling In The Garden' invites us to share our flowers and leafy loveliness in a vase. This week's pickings mainly come from the allotment where I'm spending what seems a disproportionate amount of time at the moment. I was quite excited when the weather forecast was predicting cloud and cooler temperatures today as my allotment plot is almost all in sun. The only shade is offered by area around the gate. However once again the forecast was adrift and my plans to work there all day were curtailed as I could feel myself overheating. Still progress is being made albeit slowly as I catch up from my allotment absence during early spring when it was so cold and wet. Those days are already seeming a dim and distant memory. Some salvia officinalis or sage flowers which most popular with the bees. Allium schoenoprasum or chive flowers. Sometimes I scatter the flowers over salads - just a modest amount as they are quite peppery. Centaurea cyanus or cornflower to give them their familiar common name. These are dark flowers which seem to have been swallowed up in the photo. Blue would have been more effective in the vase but there was only a solitary open blue flower. The plant is a self seeder which I moved from one bed to another back in March. It is a sturdy and flourishing plant which is mysteriously sporting black flowers and one blue flower to date. Maybe it is two plants rather than one. Lesson learned - I will be sowing cornflowers direct come September. The yellow roses are not from my plot but come from a wilding that grows on the site. It seems to survive quite happily with no special attention from anybody. Sambucus also known as elderflower. These frothy heads were picked from the elderflower on the other side of the stream which runs alongside one the the garden boundaries. I can see it from the kitchen window and love the way the flowers light up at dusk. Finally a grassy head of two of luzula nivea from the garden. The crystal vase was a retirement present from a colleague and the tablecloth came out just because the vase looked as if it needed it. Thanks as always Cathy for your most excellent hosting of 'In A Vase On Monday'. I must apologise to anybody who had problems commenting last week. Blogger has imposed changes on the comment system and not for the better. A special thanks to anybody who had to persevere to make their voice heard. I have been muttering about changing to Wordpress for some time and am thinking that will be a priority on the to do list once the sun stops shining. If I could press a pause button on one month of the year it would have to be May with its always unfailing freshness and promise. This May has been exceptionally sweet albeit a challenge at times. The greenhouse and new plantings have both needed extra in the way of watering and some seedlings were scorched which is unheard of in my shady greenhouse. It's also been too hot for me to work out there at times. It looks as if May 2018 will be going down in the record books both for sunshine hours and for its temperatures. This Met Office snippet goes into more detail. It seemed to me that we almost bypassed spring this year and shot straight through to summer. In the garden the usual suspects and amongst my favourites - aquilegias, Solomon's Seal, lamprocapnus spectablis 'Alba', lunaria annua variegata, lamium orvala, lily of the valley, anthriscus sylvestris, chaerophyllum hirsutum 'Rosea', and geranium phaeums of various hues have provided their usual joy. The biggest disappointment was the failure of the Pacific Coast iris to flower. This is a plant that I've had for over twenty years and it has never sulked before. Perhaps it was a combination of the winter and being perhaps too congested that led to it not showing. The iris has now been earmarked for division as soon as possible. My favourite new plant of the month just had to be lunaria rediviva which is a perennial honesty. I grew this from seed last year when it produced a huge sturdy plant bearing-heart shaped leaves. It was moved in late March/ early April as it was in the wrong place. Come May it was a mass of deliciously scented pale lilac flowers. The flowers have nearly all gone over now and the elliptical seed heads are appearing. It was an absolute treat when it flowered but sadly didn't like its photo being taken so I will have to wait another year. Close behind in second place was the foliage of athyrium 'Ghost'. As for the allotment the least said the better. Like many of my other fellow plot holders I'm well behind the game. Until this month the main path leading to my plot has been like a quagmire so not in the least bit inviting. I normally try to give all the raised beds a spring clean before planting them up but I'm still catching up with that now. Still there is some stuff on the move including a bed of 'Charlotte' potatoes.The French climbing beans are in along with courgettes and patty pan squash. I've planted one bed with new strawberry plants. The cut flower bed is now planted up with geum 'Mrs Bradshaw', nasturtiums, rudbeckia 'Sahara', zinnias, dahlias, calendula 'Shades Of Red', cornflowers, scabiosa 'Tall Double Mixed' and just the one wigwam of sweet peas. I normally have two but sweet pea germination was abysmal. Tomorrow it's the turn of beetroot and mange tout peas to be planted. In the second week of May we visited the Malvern Spring Show. I intended to blog about it at the time but the best laid plans of mice and men and all that. It had been a few years since we had visited the spring show and we had a thoroughly enjoyable couple of days away. As always the highlight for me was the floral marquee. The weather was even warm enough for us to eat outside the camper van on the second evening of our stay. New plant purchases this month include my show purchases of a long wanted lamium orvala 'Album', geranium phaeum' Album', epimedium 'Hakubai', geum 'Eden Valley Angel' and thalictrum 'Black Stockings'. A couple of plants namely thalictrum delavayi 'Spendide White' and actaea 'Queen of Sheba' have been purchased from our local nursery at 'Bluebell Cottage Gardens'. 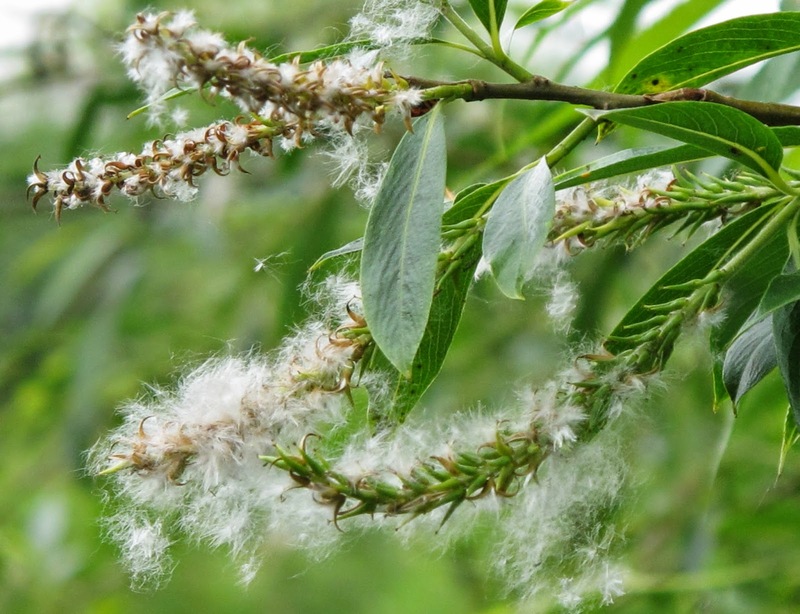 Sadly the last few days of May always coincides with the end of my love affair with the month, when the large willow tree (just outside our garden boundary) starts its inconsiderate and unsightly annual shedding of its innocent looking fluffy catkins all over the show. Appearances are deceptive and these catkins are bad news! Some days it's almost like it's snowing out there so we are careful to keep our mouths firmly shut when we venture out. Everywhere is covered with a layer of fluff. Opening windows at this time is fatal and we are convinced that our television reception is compromised. Himself hosed down the satellite dish today to see if things would improve. Oh well May was fabulous until then. Thanks to the lovely Helen over at 'A Patient Gardeners' Weblog' for hosting. It seems an age since I've done an end of month view so it's good to be back.